Thread: Bringing up kids with "them" in the house. Written by the SP owner for his daughter in reponse to a woman criticizing her for owning firearms. By the age of 5 Tommy was convinced that his dad was hiding something very special in the closet on the top shelf. "Tommy, don't you ever go into that closet. Stay out! Something bad is in there". At 5 Tommy was definitely afraid to go into that closet..... but Tommy didn't stay 5 years old. Tommy grew, and so did his curiosity. He had stood in front of that closet a number of times when his dad came into the room and sternly warned. "Tommy!! Don't you dare!!" And Tommy didn't dare..... at least not then. But that day did come.... at age 8. Dad and mom were gone shopping. His Aunt was baby sitting and she was outside in the garden. Tommy was alone. Dragging a kitchen chair to the closet, he opened it, pushed the chair inside, climbed up and stood on his tiptoes. Nothing there......... nothing but a shoebox. Could that be it?? He carefully removed the box from the shelf, climbed down from the chair, sat on the closet floor and opened the box. *Wow! How cool! Its just like the cops use on TV! * He found that the cylinder rotated and made a clicking sound. The trigger was too hard to pull so he gave up trying, but..... the hammer! That thing at the back! He was able to pull it back. But now what? Looking at the muzzle of the pistol, he carefully squeezed the trigger. CLICK! *Wow! How cool* Click..... again. A scream from his Aunt caused him to drop the revolver. "What are you doing!!?? Give me that!!" Tommy dropped the pistol in fear. What had he done? It couldn't be that bad.... besides it looked so cool! Tommy's dad had made two serious mistakes. First and foremost..... Tommy knew nothing about the dangerous weapon he'd been holding. Secondly, and fortunately for Tommy....... it wasn't loaded. She had just turned 5 years old, and I knew it was time. She was aware theat there were firearms in the house because she'd seen them from the time she was cognizant of her surroundings, and they were always well out of reach, but her time had now come. First came the simple explanation of how any of the firearms in the house could hurt her, or Mommy or Dad. Nodding her head she signified that she understood.......... but she didn't. Not at that age. She followed me outside and thought the huge hearing protective headset I put on her was pretty neat. I placed a milk jug full of water just 10 feet away. Donning my own ear protection, I put both of her hands around the grips on the huge .44 pistol. Covering both of her hands with mine, I held the pistol as far away from her little body as I could and slowly squeezed the trigger. Despite the headsets the noise and concussion were horrendous, at least for that little girl they were. The milkjug exploded in a vapor of water leaving Rosemary wide eyed and trembling. Not a word was said at that moment. I unloaded the pistol, took off her headset and we went to where the jug had been. She looked up at me and I asked her if she understood how dangerous any of our firearms could be. She solemnly nodded her head and from that day until she received her own firearms she never went near any of them in the house. The odd and surprising thing was when I heard her tell her visiting friends to "stay away from all the firearms in the house!!" And she kept a weather eye on any young visitors. Fortunately all of her friends had parents who had provided an early education to their children as well. Mystery provokes curiosity. Education removes mystery. Among her peers and their families, we've never in our Family history heard of a child injured by a firearm in our area. Rosemary carrys a pistol with her wherever she goes, as does her Brother. We live a long way from town and in the past 10 years or so there are a lot of newcomers from the west coast cities, and with them comes their baggage, IE: crime. Both of my children were required to read two books before owning their own pistols. "In the Gravest Extreme" , Masaad Ayoob and "No Second Place Winners", Bill Jordan. Books outling the seriousness of carrying firearms and the legal implications involved. Both of them were taught use and respect of both pistols and rifles. Both have their own pistols and rifles. I'll go into their education another time, but rest assured that both of them were taught respect for firearms at a very early age. Mystery provokes curiosity and potential disater. Education removes mystery and ingrains understanding. Think about this one with logic and practical application. SP, I firmly agree with removing the mystery, so that the temptation to "play" with them is not there. My son is 9, and has shot all of my handguns, with assistance. He has chosen to stick to his mother's Walther P22, because even with assistance, the recoil from a 9mm and .45 is too much for him. His choice, and rightly made IMO. The only concern I would have in the story, is using such a large gun for the lesson with the little girl. I'd be worried to frighten them TOO much... to where they would never find it enjoyable. He used a large caliber for the full shock effect. A .22 would not have made a solid impression, but I know her well and she grew up straight and fearless. His son went through the same process. NRA eddie eagle program, when my son was 6 he used to pick up a water pistol "finger off trigger". Dad did the same thing with me, a 1911, and a watermelon. After the watermelon exploded into mist he told me that was what it would do to anything. Me, him, mom, my dog, anything! So I was not to touch without asking him first. Later when he would let me shoot some of the lighter caliber stuff I always had to clean it afterwards. That went a long way towards removing the "mystique" and made guns into just another durned tool that requires maintenance <grin>. No toy guns except water pistols in my house. Weapons were in the open but ammo was secured, kids were started on BB guns between 4 and 5 and 22 by 6. By the age of 12 they could handle my 45 and keep most shots inside the scoring circle. If they wanted to shoot all they had to do was ask, I rarely said no. Guns were not mysterious items to them. The "mystery" went away real early at our home. Between shooting, butchering, and eating squirrels, rabbits, ducks, geese, wild chickens, deer, sheep, cattle, pigs, and bear, the connections between guns and mortal holes in flesh were no mystery. We took the mystery away real early in my house. Guns were not toys, but real things that would hurt or kill if mishandled. We have never had an ND or any other problem, and my kids are both in their early 30's now. Concur. I've even had the privilege of educating a friend's kids. At the end of a .22 shooting session with his sons (I was the instructor), I pulled out a water-filled gallon jug, a .357 revolver, and a Magsafe round. Handed it to the most gun-interested of the boys. Had him aim at the center of the jug. He look at me worried before he shot--"Is the recoil going to hurt?" "No worries," I said, "You won't notice any pain until after you wake up." He winked, aimed, and the gallon jug disappeared. Largest piece of plastic was probably half the size of a dollar bill. I think everyone understood: Don't point the muzzle at anything you're not willing to destroy. A great visual aid is a large can of crushed tomatoes; shoot it with a good high-vel .22, and it gets about a 7 on the Gory Mess scale and gets the attention of the most Halo-jaded kid. It also sets the lesson that yes, that little tiny .22 slug did THAT. And it can do it to you, too, or your friend, or your puppy. If a kid doesn't want to shoot, leave it at that (leave peer pressure to the brothers and sisters), but ask if they want to watch, and make sure they get glasses/muffs. Probably 75% of the time, the wallflower eventually asks for a turn. I came up with a great plinking target for my niece- ice. I froze up some water in paper cups and hauled them to the Shootin' Spot in a cooler. Strip off the cup and you're good to go. They blow up great, and leave progressively more challenging targets. You don't have to anything to clean up, either. They also kept our PBJ sandwiches cool. All four of my kids were raised around firearms, and safety training was mandatory, pretty much forced down their throats. They were all told that they could handle any firearm they wanted to, as long as they asked first. Family outings generally revolved around shooting, or ended with a little range time. Soda cans on the backstop made great training aids, and they were encouraged to keep the can moving. My youngest son started shooting handguns at age three, and I don't mean airguns. 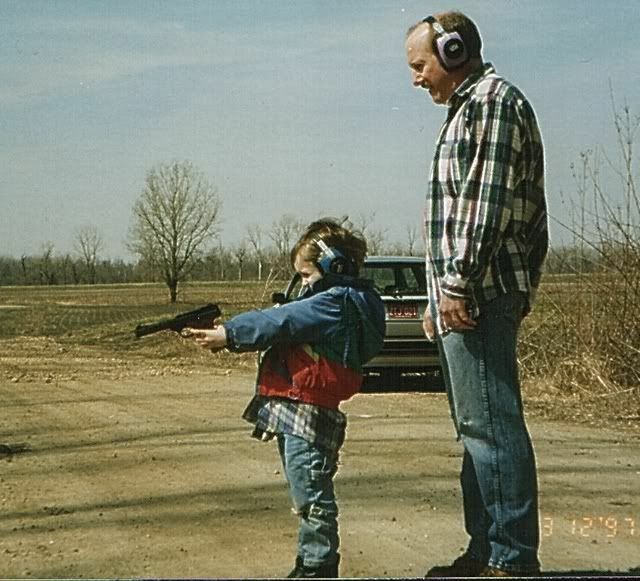 He exhibited better gunhandling habits than most adults I've seen. Still does. My girls eventually discovered other amusement, but they still like to shoot now and then. And they are both dangerous with handguns out past 100 yards. Of all the pictures I've taken of my kids with guns over the years, this one is still my favorite.......his first shot ever, at age three. And he drilled the soda can dead center. Hard to say who was more proud! I raised my four kids on a place in the country and we had a family range right outside the back door. We shot lots of vegetables and gourds. And lots of squirrels, rabbits and ducks. I live in suburbia now, but the grandkids are all learning. Three of us are going to the lease tomorrow morning. Gunfire will probably be involved. There is no magic that will keep the kids safe just as there is no solution to crime, the war on drugs, the war on terror or where your socks end up in the wash. Teach them and be as careful as you can be. Remove the mystery, agreed. The second part of the equation is to keep them secured so that childhood lapses in judgement don't result in tradjedy. My son knows not to touch guns (yet. He's only 4) but knows they are around and we don't hide them from him. The HD guns, a pistol apiece for the wife and I along with a 12ga and AR, are kept ready but out of reach from our son. He's growing, so that will change, but the placement will change when needed. It already has once. I wish I believed in reincarnation. Where's Charles "The Hammer" Martel when you need him? yes, I play the bagpipes. No, I don't wear a skirt. It's called a kilt. Some of the smartest people I've known were "dumb hillbillies". Raised 4 kids with guns all over the house - the one thing they were taught from diapers was if they even TOUCHED a gun - ANY gun - without my specific permission, they'd not be able to sit down for a week. And yeah, I boobie-trapped 'em, puttin' a thin coat of carbon black on a gun that I'd not only unload, but remove the firing pin on, then set out on a table without being around. They never quite figured out how Daddy knew who the offender was, but they decided real quick it wasn't worth the pain, especially when all they had to do was ask, and we'd go to the ranch or the range, and they could shoot anything they desired. The oldest boy shot his first deer at 7. The daughter never got into hunting, but LOVED going to the range, where she'd routinely delight in shaming more experienced shooters in competition (they all shot competitively from about 10 yrs. of age). Nice thing about having a place in the country was we could go out there and show them how quickly a living thing could become dead. In the process of cleaning it, they'd have a chance to observe the wound channel and the results the round had on living tissue. One of their favorites was when I demo'd that a FMJ .223 round would fully penetrate a telephone pole - then had them try to hammer a 16 penny nail into the same pole. I dont have kids yet but when i do they will all be mandated to learn how to use guns and hear the story about how my dad got shot by a 30-30. Hes still alive but he lost most of his thumb and the feeling in some parts of his hand. The truck you drive says a lot about you, the guns you shoot say even more. Friends don't let friends drive Fords/Dodges. the last two represented a thousand miles of mowed lawns and delivered newspapers plus any thing else I could do to get money . Some time in there I learned to reload , cast bullets and picked up a 30-06 . Just like beer. Give the kids a couple oz and watch the look on their faces. They will get around to it sooner/later but the mystery is gone. When I was a kid the mystery was when my dad would take his guns out of hiding to go hunting. My brother and I would always want him to show us. He always would teach us safety and he made us watch the eddie eagle video and because of all of this I grew up with a fear and respect for firearms. Because he would show them to us when were kids it sort of took the mystery out of it. He then got us BB guns and made sure we followed all the safety rules. Finally a few years later he took us out ad let us shoot .22s. The next time I shot a real gun was when I was 15 when I started turkey hunting. Then I started taking a huge interest in guns around 19, when I found some friends in college how would go shooting. Now, I'm 23 and I could have paid for one of the semesters in college with what I have invested in guns, ammo, and accessories. Now, I'm 23 and I could have paid for one of the semesters in college with what I have invested in guns, ammo, and accessories. Don't worry - as you get older and make more $$$, you'll be able to afford a REAL collection! In addition to the previously recommended Cornered Cat site by Pax, there's also Janis Cortese's page (linked to from Cornered Cat) has a section on Children and Handguns. Cornered Cat is, in my opinion, an invaluable site for anyone who has little to no experience with firearms, but is interested in getting into them. And it doesn't hurt to read it if you're already familiar with firearms, but interested in introducing new shooters (especially women and children) to firearms. "Our society is no longer imaginable without gun violence. All too often during muggings and robberies, a firearm is used to threaten." Im old enough to have kids, young enough to still remember being one! I agree 100% with the remove the curiosity. My Dad did this, even let us shoot his guns (with him). I do not ever remember a time where any of us (5 kids) ever got into the guns, without Dad/permission. We knew he would show us/ and let us shoot with him if we asked. There was no need to risk getting in trouble. He did keep the ammunition locked up. I plan to follow the same model.